In this May 18, 2018, file photo, lava erupts and flows from a Kilauea volcano fissure on Hawaii's Big Island in Kapoho, Hawaii. Lava from the Kilauea volcano covered at least one well Sunday at a geothermal power plant on the Big Island, according to a Hawaii County Civil Defense report. The well was successfully plugged in anticipation of the lava flow, and a second well 100 feet (30.5 meters) away has also been secured, according to the report. The plugs protect against the release of gas that could turn toxic when mixed with lava. The lava breached the property overnight. David Mace, a spokesman for the Federal Emergency Management Agency, said the flow started about 200 yards (183 meters) away from the nearest well. But he said safety precautions went into effect before the breach. "I think it's safe to say authorities have been concerned about the flow of lava onto the plant property since the eruption started," he said. Puna Geothermal, owned by Nevada's Ormat Technologies, was shut down shortly after Kilauea began spewing lava on May 3. The plant harnesses heat and steam from the Earth's core to spin turbines to generate power. A flammable gas called pentane is used as part of the process, though officials earlier this month removed 50,000 gallons (189,265 liters) of the gas from the plant to reduce the chance of explosions. They also capped the 11 wells at the property to try to prevent a breach. Before the lava reached the well, plant spokesman Mike Kaleikini told the news agency Hawaii News Now that there was no indication of the release of the poisonous gas hydrogen sulfide — the greatest fear should lava hit the wells. "As long as conditions are safe, we will have personnel on site," Kaleikini said. 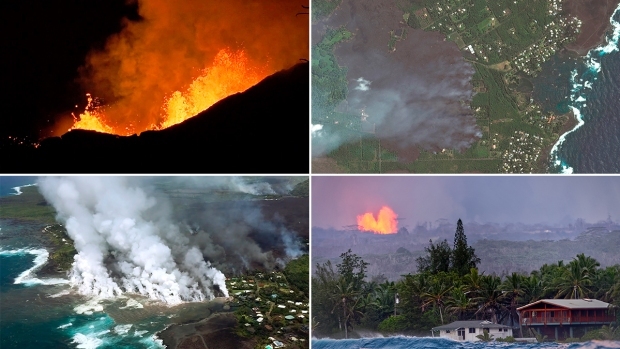 "Primary concern is sulfur dioxide from the eruption and lava coming on site. We monitor for hydrogen sulfide and sulfur dioxide on a continuous basis." Steve Brantley of the Hawaiian Volcano Observatory said the flow seemed to have halted Sunday morning before it picked back up and covered the well at the plant, which lies on the southeast flank of the volcano, nestled between residential neighborhoods. Lava-filled fissures have torn apart chunks of the southeastern side of the Big Island over the past three weeks as Kilaeau has become more active.